For over a century, Perham Health has been a renowned leader in providing compassionate care for their regional lakes community in the upper Midwest. 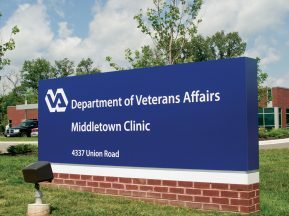 In 2011, they completed construction of a new, state-of-the art hospital and clinic dedicated to supporting patient and family-centered care, improving caregiver efficiency and promoting a healing and welcoming environment. Perham Health’s new 127,000 s.f. facility focuses on families, making sure they have a part in patient’s care. One of their goals was to create a healing-focused hospital and clinic that would feel more calming and welcoming to patients, visitors, and caregivers. Perham Health asked the interior design and architecture firm, Horty Elving, to design a sustainable, environmentally conscious facility featuring natural light, wood, water and vegetation. The final design features spacious corridors and departments with loads of natural light to flow throughout the hospital. Warm woods and natural stone building elements make the waiting and treatment areas feel more like a relaxing spa or resort, which helps alleviate the natural anxiety patients and visitors feel in a hospital environment. Perham Health also has wide-open patient rooms with space for loved ones, and an easy layout so people feel peaceful. 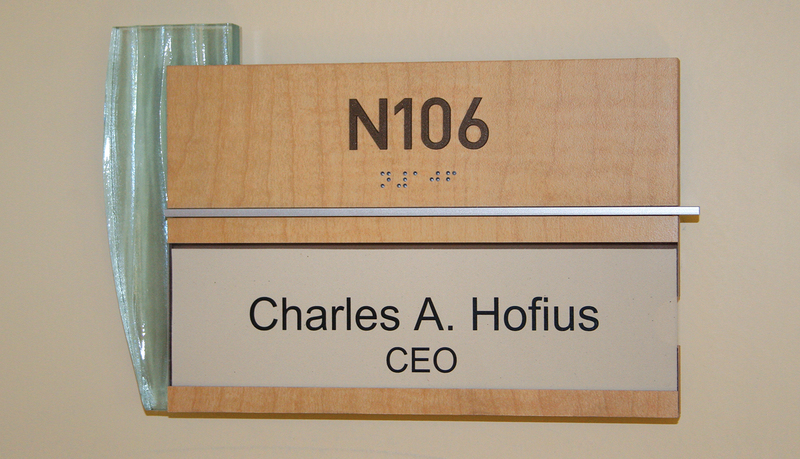 Once the architectural design was complete, Perham Health and Horty Elving required a partner to design, engineer and deliver a turn-key interior signage solution that complemented the healing-focused environment. 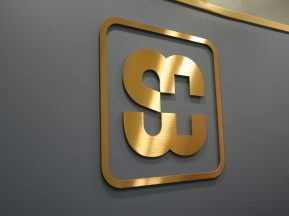 ASI was selected as the ideal partner due to our reputation as being a leading provider of signage solutions, our creative design concepts and our commitment to delivering the project on time and within budget. 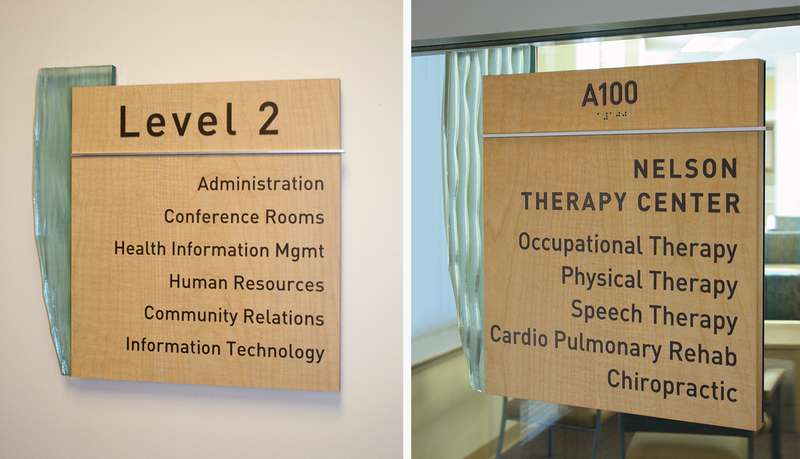 By implementing a custom designed Terra signage solution, which is comprised of 3form materials, wood grains and metal accents, the interior signage helps accentuate and promote the natural décor of the hospital. 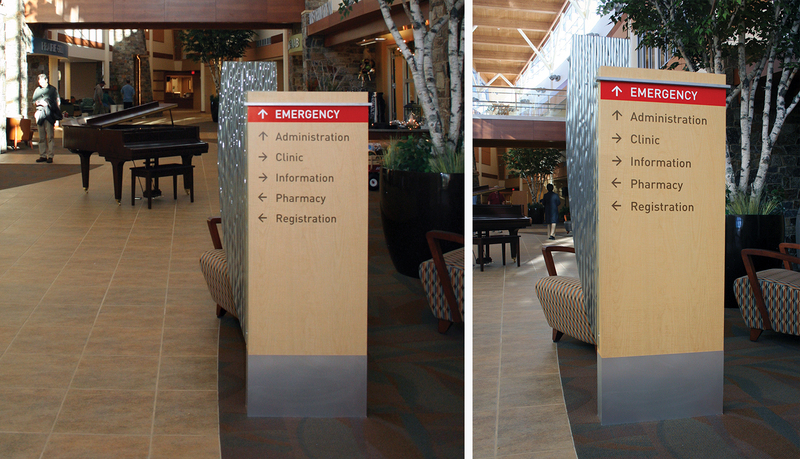 In addition, ASI consulted on the wayfinding plan and promoted the philosophy that “less is more” when it comes to signage in a hospital. 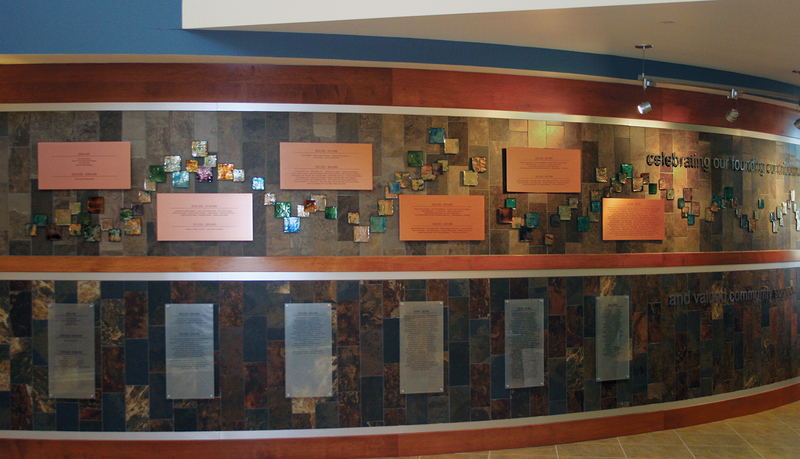 ASI also helped inspire ideas and fabricate the donor recognition wall which features etched copper and glass plaques coupled with dimensional letters and custom copper tiles designed by a local artist. 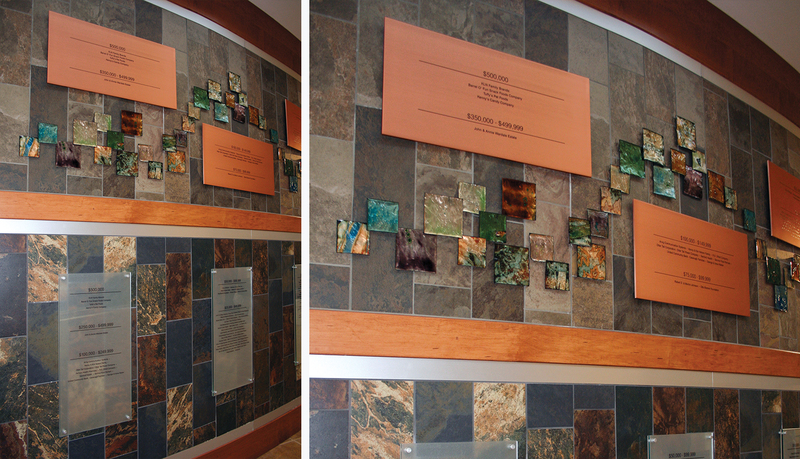 The donor wall is situated right next to a flowing waterfall in the grand 2-story atrium and has received positive feedback and reviews by the community. 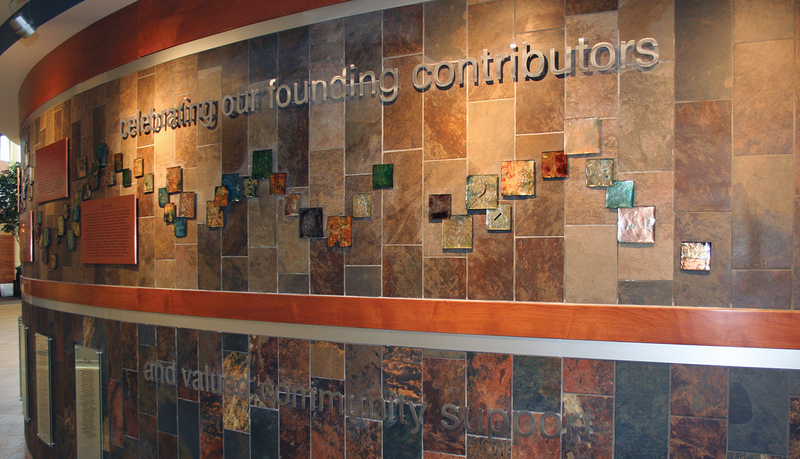 The Community Relations Director said the new donor recognition wall is ‘stunning’. 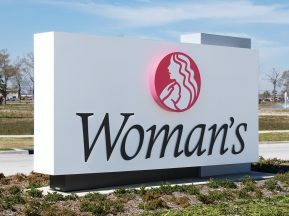 I heard random comments about the signage in the hospital as well. People said the signage was ‘really cool’ and beautiful. Thank you for all your hard work to meet the deadlines. I really appreciate it. I look forward to working with all of you on future projects.